When it comes to our health, “out of sight, out of mind” can be an easy, throw-it-in-auto-drive approach. See a funny shaped mole on your back? Get it checked by a dermatologist. Swollen, black and blue knee? Head to the ER. Many of us don’t put a whole lot of thought into the things we can’t see in the mirror—like our bones. And by the time we do start thinking about our bone health, oftentimes, says Marie Chandler, physical therapist at Baylor Scott and White Health and educator for American Bone Health, it’s too late. 24Life sat down with Chandler—who has been a practicing physical therapist for more than 40 years and has been a Polestar Pilates instructor for more than a decade—to break down common misconceptions about bone health and a few straightforward ways we can start taking care of our bones now, no matter our age. 24Life: What are some common misconceptions about bone health that you come across in your profession? Marie Chandler: Bone health starts early on, but despite your age, there is the possibility to improve your bone health. We build up what I call a savings account of calcium in our bones when we’re in our preteens. From about the age of 30 on, we start losing it. But what’s interesting is, in our bones, we have osteoblasts and osteoclasts. Osteoblasts build new bone, and osteoclasts remove the old or damaged bone in an ongoing process called bone remodeling. So the bones that we have today are not the same bones we had seven to 10 years ago, and they won’t be the same bones we have seven to 10 years from this point on—a common misconception. 24Life: Should we be asking for a bone density test earlier than our 50s? Osteoporosis is a very silent, prevalent disease. We can’t see it. A lot of people have no clue about having a bone density examination or bone density testing. Many people don’t consider it an issue until they are in their 50s or 60s. And by that time, unfortunately, it can almost be too late. There are also around 2 million preventable fractures every year, compared to other health problems like breast cancer [266,120 occurrences], heart attacks [790,000] and strokes [800,000]. Every 11 seconds, a senior is admitted to the emergency room with a preventable fracture. A lot of these fractures can contribute to an earlier death. 24Life: So what can we do to strengthen our bones, no matter our age? MC: If we don’t move it, we lose it. Flexibility is the key to longevity. If we can move, we will be able to live longer because we’ll be able to move and get around. That’s why we preach to people that you’ve got to be active. You’ve got to train. You’ve got to keep your strength up. Look at how much calcium you’re consuming. You need vitamin D in order to allow the calcium to be absorbed into your body through the intestines. So that’s important. There are two types of calcium supplements out there. But as much as you can get from your diet is really important. So if you don’t eat two to three servings of calcium-rich foods, then you probably are going to need a supplement. The body can only absorb 500 to 600 milligrams of calcium at a time. You don’t want to take it all at one time (so it absorbs properly), and you don’t really want to take more than that. Researchers are finding that a lot of people are very deficient in vitamin D. People need anywhere from 600 to 2,000 international units every day, and you can’t get that much from the sun. So you do probably need to supplement your vitamin D if you have a deficiency. A lot of doctors now are running vitamin D tests. 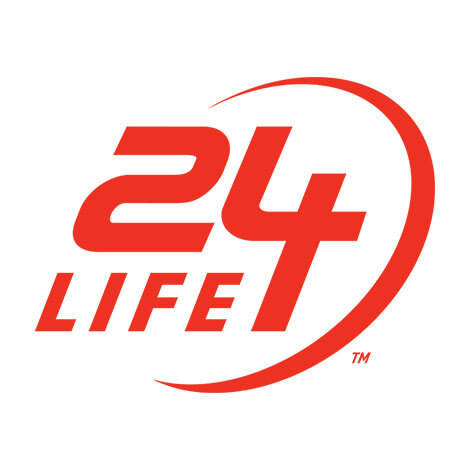 24Life: Specifically, what type of movement should we be doing to better our bones? MC: When we’re training, we want to surprise the bone by giving it some impact because that’s how it’s going to stimulate bone growth. If you think about it, you have a weight-bearing bone and you’ve had a fracture, and the doctor is going to want you to put weight on it eventually because that starts building the bone back. Therefore, we want to start getting people to do some weight-bearing activities to help keep their bones strong. Water exercise is great for mobility, it’s great for flexibility, but there’s no impact. So, it’s not going to be a bone-building activity. Activities that are going to strengthen the muscle are going to strengthen the bone. Jumping is a great strength- training activity. [In my] mat Pilates class for people with osteoporosis, I don’t necessarily have them jump, but I have them do pounding [their feet on the ground]. Running or jogging is good because that’s a weight-bearing activity. A brisk walk is good, but it’s a little less weight-bearing. Swimming and cycling are probably the least effective as far as building bone density. Weight training in the gym is very important. And a lot of older people think, “Oh, no. I can’t do that. That’s too much strength.” But there are some very effective strengthening exercises that you can do. I mean, a leg press is a great movement. You don’t have to press 500 pounds. 24Life: What if someone has been diagnosed with osteoporosis? What can they do? MC: The first thing you want to do is get up and move. The last thing you want to do is sit down and not do anything. We need to work out with proper posture. Think three points of pressure: the back of the head, the middle of your back and your sacrum. Stand up against a wall and feel those three points. You have an arch at your neck and an arch in your lower back. That’s proper posture. Then the next thing you want to think about is balance. For example, how long can you stand on one leg. Lift a foot off the floor and see how long you can hold it. You also want to look at core strength because that plus balance and flexibility are going to prevent a fall. Core strength is your entire torso: the abdomen, the spine muscles on the back, the diaphragm and the pelvic floor. 24Life: Working on balance, flexibility and core strength also helps prevent falls—what are some other ways to prevent falls (and by extension fractures)? MC: First of all, be mindful of your activities. Second, do a little home safety check around your home. Look at every room in terms of throw rugs and lighting. You need proper lighting to be able to see. Or have you had your eyes checked? People who wear glasses, sometimes that’s going to affect their balance, how well they can see. Also, an average of 86,629 Americans visit the ER annually from falls caused by pets. American Bone Health teaches people how to build and keep strong and healthy bones for life with practical and up-to-date information and resources to inspire them to prevent bone loss, osteoporosis and fractures. Join American Bone Health for the National Council on Aging’s Fall Prevention Week and its third annual Stepping Out Strong, taking place September 23-30. Find an event near you.